Now that the CityKids and Friends of Sunset Park music events have ended, whatever will camps and caretakers of children do on Wednesday mornings?? Not to fear, FoSP is still looking out for us. 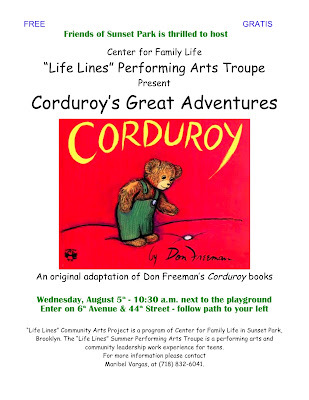 This Wednesday will feature Life Lines performers giving us Corduroy - the bear with a lost button. This has recently become one of my son's favorite books, so I'm hoping he lasts through this performance. The Center for Family Life is the co-sponsor of this event.